The Grammy Award for Best Traditional Pop Vocal Album is an award presented to recording artists at the Grammy Awards, a ceremony that was established in 1958 and originally called the Gramophone Awards. Honors in several categories are presented at the ceremony annually by the National Academy of Recording Arts and Sciences of the United States to "honor artistic achievement, technical proficiency and overall excellence in the recording industry, without regard to album sales or chart position". The award has been presented every year since 1992, though the award has had two name changes throughout its history. In 1992 the award was known as Best Traditional Pop Performance, from 1993 to 2000 the award was known as Best Traditional Pop Vocal Performance, and since 2001 it has been awarded as Best Traditional Pop Vocal Album. Apart from the first year it was presented, the award has been designated for "albums containing 51% or more playing time of vocal tracks", with "traditional" referring to the "composition, vocal styling, and the instrumental arrangement" of the body of music known as the Great American Songbook. The 1992 award was presented to Natalie Cole for the "spliced-together" duet of her and her father, Nat King Cole, performing his original recording of "Unforgettable". This is the only instance in which the traditional pop award was awarded for a song, as opposed to an album. Prior to 2001, the Grammy was presented to the performing artists only; since then the award has been given to the performing artists, the engineers/mixers, as well as the producers. 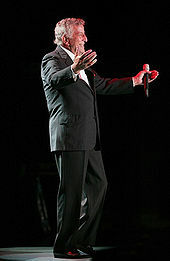 As of 2016[update], Tony Bennett holds the record for the most wins in this category, with thirteen (including one along with k.d. lang, one with Lady Gaga and one with Bill Charlap). Natalie Cole, Michael Bublé, and Willie Nelson are the only other recipients to receive the award more than once. Willie Nelson has won twice. ^[II] Award only went to a producer of the album, not the performing artist(s). "Past Winners Search". National Academy of Recording Arts and Sciences. Retrieved March 4, 2011. Note: User must select the "Traditional Pop" category as the genre under the search feature. ^ a b "Nominees: Best Traditional Pop Vocal Album". National Academy of Recording Arts and Sciences. Retrieved December 22, 2009. ^ a b "52nd OEP Category Description Guide" (PDF). National Academy of Recording Arts and Sciences. p. 2. Archived from the original (PDF) on October 27, 2009. Retrieved May 25, 2010. ^ "Grammy Awards at a Glance". Los Angeles Times. Retrieved January 28, 2010. ^ "Overview". National Academy of Recording Arts and Sciences. Archived from the original on October 27, 2009. Retrieved February 8, 2010. ^ "Natalie Cole gets 7 Grammys". The Spokesman-Review. Cowles Publishing Company. February 26, 1992. Retrieved December 22, 2009. ^ "R.E.M., Cole, Raitt top list of Grammy nominees". Herald-Journal. January 6, 1992. Retrieved February 5, 2010. ^ "34th Grammy Awards – 1992". Rock on the Net. Retrieved February 5, 2010. ^ "Grammy nominees". The Baltimore Sun. January 8, 1993. Retrieved February 5, 2010. ^ Campbell, Mary (January 7, 1994). "Sting, Joel top Grammy nominations". Star-News. Archived from the original on July 18, 2012. Retrieved February 5, 2010. ^ "The 37th Grammy Nominations". Los Angeles Times. January 6, 1995. p. 2. Retrieved February 4, 2010. ^ "List of Grammy nominees". CNN. January 4, 1996. Retrieved February 4, 2010. ^ "Babyface, Celine Dion Dominate Grammy Nominations". E!. January 7, 1997. Retrieved February 4, 2010. ^ "40th Grammy Awards". Rock on the Net. Retrieved February 5, 2010. ^ "Academy's Complete List of Nominees". Los Angeles Times. January 6, 1999. p. 2. Retrieved February 5, 2010. ^ "42nd Annual Grammy Awards – 2000". Rock on the Net. Retrieved February 5, 2010. ^ "43rd Grammy Awards". CNN. February 21, 2001. Archived from the original on November 6, 2008. Retrieved February 4, 2010. ^ "Complete List Of Grammy Nominees". CBS News. January 4, 2002. Retrieved February 4, 2010. ^ "Grammy Nominations: Complete List". Fox News Channel. January 3, 2003. Archived from the original on 2012-10-22. Retrieved February 4, 2010. ^ "Grammy Award Winners". The New York Times. 2004. Retrieved February 4, 2010. ^ "Grammy Award nominees in top categories". USA Today. December 7, 2004. Retrieved February 4, 2010. ^ "Complete list of Grammy Award nominations". USA Today. December 8, 2005. Retrieved February 4, 2010. ^ "2008 Grammy Winners List". CBS News. December 6, 2007. Retrieved February 2, 2010. ^ "Rufus' Grammy?". BBC 6 Music. February 6, 2009. Retrieved February 2, 2010. ^ Partridge, Kenneth (December 2, 2009). "Nominees for 2010 Grammy Awards Announced -- Full List". Spinner.com. Retrieved December 29, 2009. ^ "53rd Annual Grammy Awards nominees list". Los Angeles Times. Retrieved December 5, 2010. ^ "Grammy Awards 2012: Winners and nominees list". Los Angeles Times. Archived from the original on 15 July 2014. Retrieved 30 June 2013. ^ "Grammys 2013: Winners List". Billboard. 10 February 2013. Archived from the original on 29 June 2013. Retrieved 30 June 2013. ^ "57th Grammy Nominees". Los Angeles Times. February 8, 2015. ^ Lynch, Joe (December 7, 2018). "Grammys 2019 Nominees: The Complete List". Billboard. Archived from the original on December 7, 2018. Retrieved December 8, 2018.